Should Zion Williamson really 'shut it down' to prepare for the NBA Draft as Scottie Pippen suggests? Should Zion Williamson really ‘shut it down’ to prepare for the NBA Draft as Scottie Pippen suggests? The Duke superstar freshman is a virtual lock to be the top pick in the NBA Draft at the moment. 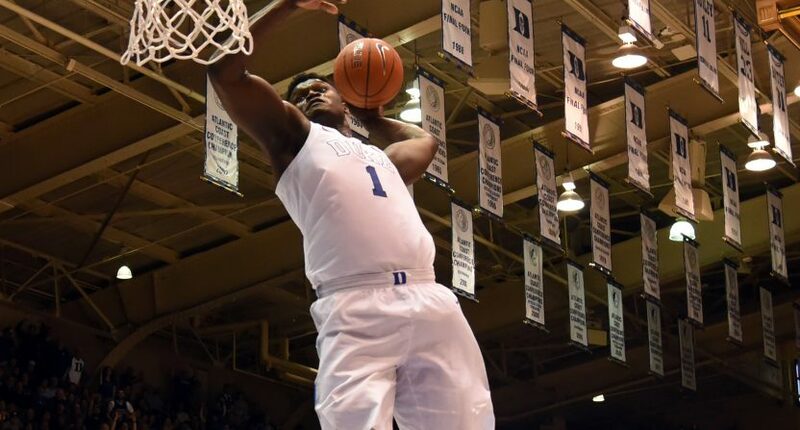 Hall of Fame basketball player Scottie Pippen made some very interesting comments about Duke star freshman Zion Williamson on Tuesday edition’s of ESPN’s The Jump. Williamson would be the No. 1 pick in the 2019 NBA Draft right now, and will be barring some crazy circumstances. Those circumstances likely involve Williamson suffering a serious injury (team/positional “fit” could always be a thing, of course, but odds are a team would trade up to take Williamson No. 1 if the team originally in that draft position wanted to go another route). And Pippen said that if he were in Williamson’s position, he would “shut it down” right now due to the risk of major injury. Pippen’s argument is a very good one. Again, Williamson is — almost surely — locked into the No. 1 draft position unless he suffers a serious injury. The 6’7″, 285-pounder is a rare talent blending size and strength with otherworldly athleticism. The 18-year-old is averaging 21.2 points (66.2% from the field), 9.4 rebounds, 2.3 assists, 2.0 steals, and 1.9 blocks for the Blue Devils in his freshman campaign. So, does the reward outweigh the risk when it comes to Williamson playing the entire season for Duke? Let’s start with the the risk– injury, of course. Explosion and athleticism are essential to Williamson’s game. He’s a “short” 6’7″ for an NBA power forward, but his power and explosion would currently be able to make up for it. And if he’s to be more of a hybrid forward at the next level (teams care less and less about positional “fit” in today’s NBA), he’ll need that athleticism to stick with small forwards. So, it’s easy to see how there could be some concern about Williamson suffering a serious knee/leg injury and the threat of losing some of that explosion. Then again, many basketball players return with the same-ish athleticism following serious leg injuries these days. And the odds of Williamson suffering such an injury over the final few months of the college season are small. The odds of him suffering an injury that’s truly debilitating for his basketball ability long term is even smaller. Let’s say — and let’s hope this doesn’t happen! — he suffers a torn ACL this season; he’d surely still be a top-five pick in June, and likely still a top-three pick because teams are more interested in upside and hitting the jackpot that high in the draft. It’s a star’s league; you need them — and likely a few of them — to win championships. So most organizations would take the chance on Williamson following a knee surgery over a lesser (healthy) prospect, even if there was uncertainty about him regaining full ability and even if he had to sit out the 2019-20 season. Okay, but what’s the reward of playing the remainder of his freshman season? Well, there’s a very real chance to win a national championship. Duke (14-2) is currently ranked No. 1 in the AP poll and No. 2 in Ken Pomeroy’s college basketball ratings. Williamson is joined by R.J. Barrett (the potential No. 2 overall draft pick) and Cam Reddish (a potential top-five pick) to form an insane freshmen trio. When this team is on their game, nobody is beating them. And even when Duke is off, it takes a remarkable performance to take them down. Williamson is a big-time competitor and this all surely means a lot to him, but is it enough to outweigh the risk of an injury that could hurt his draft stock and NBA future? That’s the tough question. There are also areas Williamson can improve his game, particularly in the shooting department. He’s shooting just 27.3% from three-point range and 70.3% from the free-throw line. The argument against that being an excuse for Williamson to keep playing for Duke is that he can work on these things on his own in the gym or with the help of shooting coaches. But the argument against that is you can’t simulate shooting in game action in an empty gym. Of course, if he’s already projected to be the top overall pick, do the areas he can improve his game matter enough to influence his decision to “shut it down” or not? The bottom line is that there is no wrong choice here, and Williamson should ultimately do whatever the heck he wants. Leave early and secure his top draft pick status? That would be completely understandable and he’s earned that choice. He’s proven all he needs to prove at the collegiate level, and you can’t fault an athlete for doing everything they can to secure money and top draft stock status while they can. Even if major injury risk is small, it still is a risk. Williamson and his representation may feel it’s not worth it to increase any chance to threaten his draft stock. And if Williamson wants to play the rest of the season at Duke? That’s fine too, and something college basketball fans will surely appreciate. He has an excellent chance to win a national title, can improve areas of his game, and continue to wow us with things we rarely see at the college basketball level. It’s a great “dilemma” for an 18-year-old to have.